Summary: This walk is a delightful horseshoe of the fells surrounding the Sleddale valley to the south of Hawes in Wensleydale. 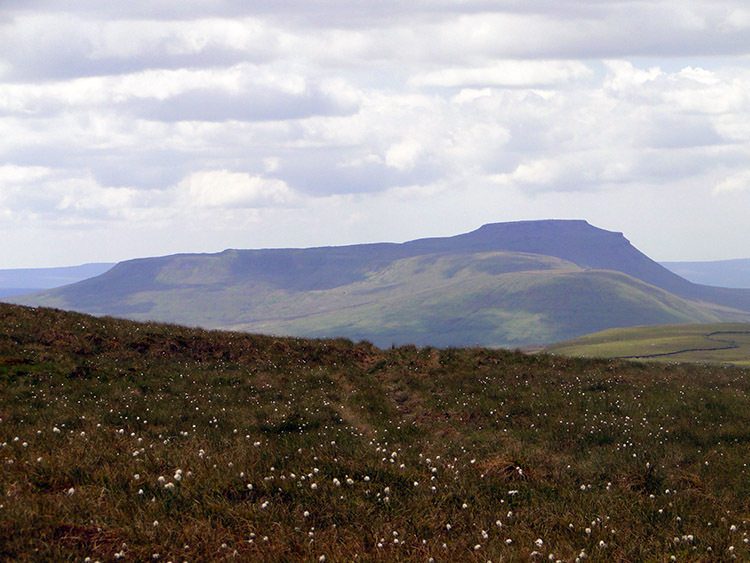 The two significant hill ranges are Drumaldrace on Wether Fell to the east and Dodd Fell Hill to the north and west. All rain, sleet and snow which falls on Wether Fell to the west and Dodd Fell to the south and east eventually find their way into Gayle Beck which flows north through Hawes and into the River Ure. 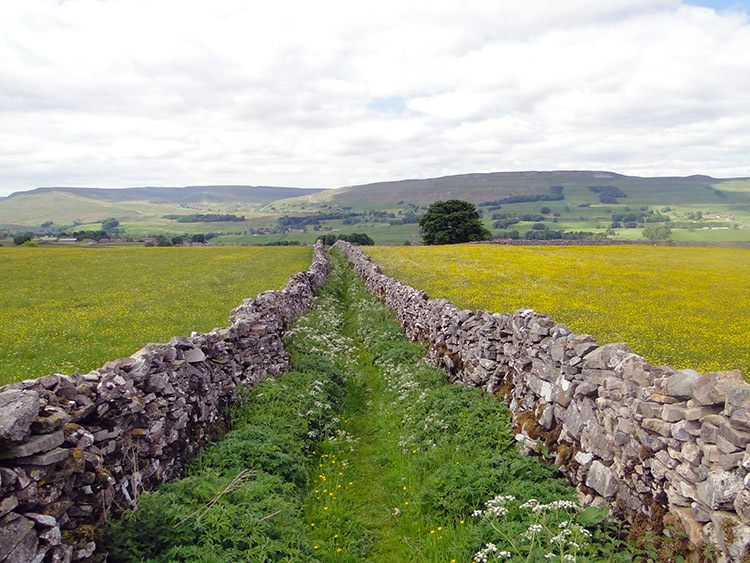 With Wensleydale Cheese made by the side of Gayle Beck this walk is closely linked to the favourite cheese of many famous folk, including Wallace and Gromit! They would love this walk, or at least the lower parts of it. For the more adventurous come with us on the whole journey. 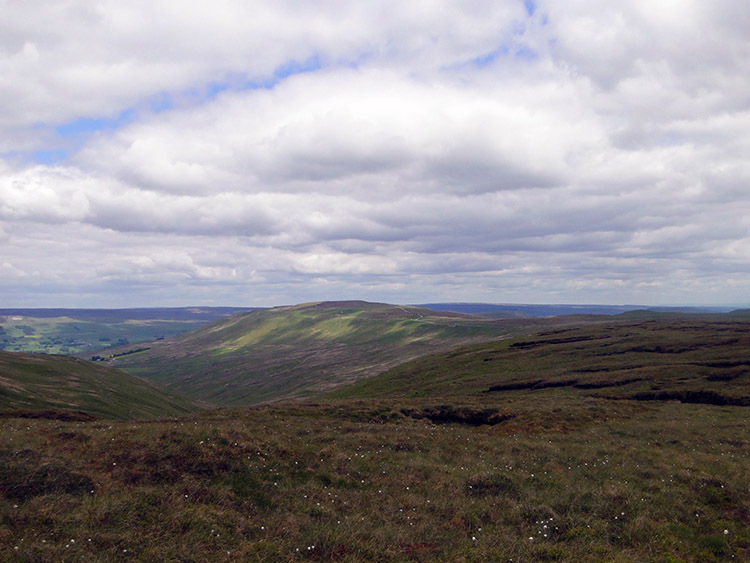 The Walk: This marvellous walk could have many titles; 'The Sleddale Horseshoe', 'Dodd Fell Hill, Drumaldrace and Wether Fell', 'The Poet's Walk'?...there's three choices for consideration and during this journey I will explain why each of the three titles have merit. Before we set off though I would like to welcome all readers to a new walker and a new friend. Welcome to Martyn Lee of Whitkirk, Leeds, a thoroughly nice chap! Also, welcome back to Jez Clapham, a friend who I had not walked with for a couple of years. Too long. As for Dave, all regular readers will know of all my brothers idiosyncrasies so lets get going shall we. Martyn, Jez, Dave and I were blessed with a wonderful summer's day to go walking. 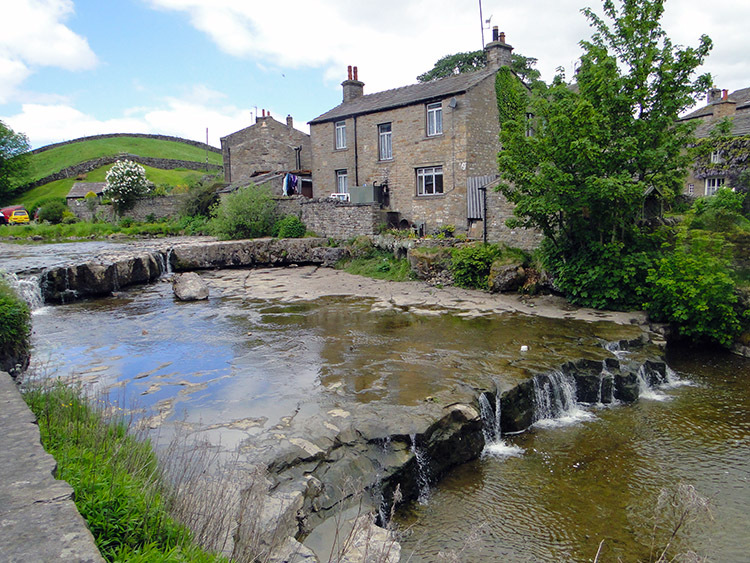 We set off from the village of Gayle, a village just south of Hawes in Wensleydale. The sun was working its way in and out of mid morning clouds but we did not mind too much when it ducked behind as we had some climbing to do and a relentless sun would have certainly got us all perspiring. As we walked Dave, Jez and I got to know Martyn and I added spice to the conversation by reminding him of his task for the day. The task 'An ode to the moustachioed sage' was to be delivered later in the walk. More on that later but for now it was up, up, up and out of Wensleydale to the higher ground. As we climbed up from Gayle to Gaudy House and past it by following Gaudy Lane the horseshoe nature of the walk became clear. The views were fantastic as the lower ground we were walking amidst was splendorous with fields of beautiful buttercup yellow. The lovely summer flower must be encouraged to pasture once again, a flower so in favour again and as a result a blessing to our eyes. It was a magnificent scene to walk through. Higher we could see Dodd Fell ahead of us and to our left we could see the long high profile of Wether Fell. Looking closely we could see Hang Gliders testing the thermals to see if they could lift off. One tried, small flights taken. As we walked Wether Fell Side blocked our view of the adventurers. More on the aeronautics to come later, for us our attention was on climbing further and with the sun making more headway through the cloud we all paused to cast a layer of clothing. Dave revealed a bright white t-shirt, mine was dark, Jez's green. "As for me, don't be alarmed by my unflattering body hugging thermal vest" said Martyn. At least it was not pink! We strode on making more height to Rottenstone Hill where we paused. I again reminded Martyn of his poetry recital to be made on the walk and after I did Dave pitched on with his own contribution. Here is Dave's poem. 'Bloody Hell, We're on a fell' - short and sweet! Well done Dave and after his effort we continued from Rottenstone Hill and up further to Ten End Peat Ground. 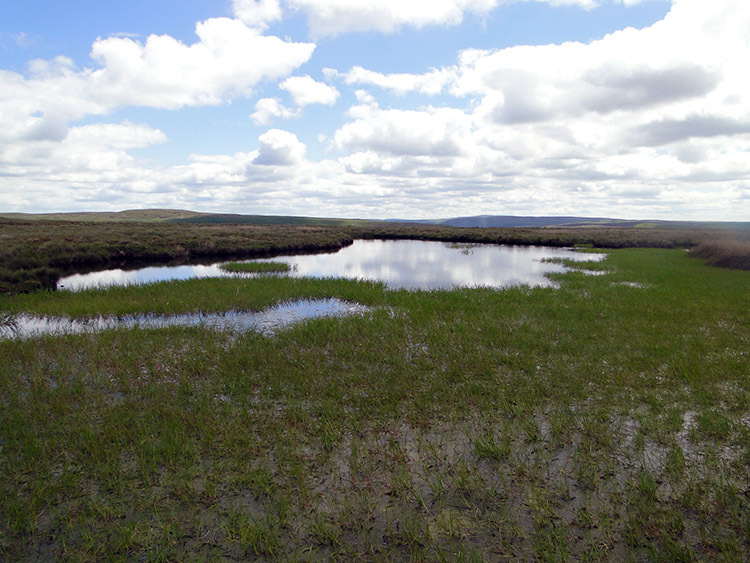 Soon we reached Ten End and after a little errant wandering looking for a small tarn we spotted it and made for the waters edge. The peace of the fell top was shattered as we approached Ten End Tarn as a lapwing took flight and cawed at us relentlessly. It's young must have been on near ground for the bird's aerial display and vocal protestations were not welcoming. We did not mean to alarm and soon we moved off to put the bird at peace. 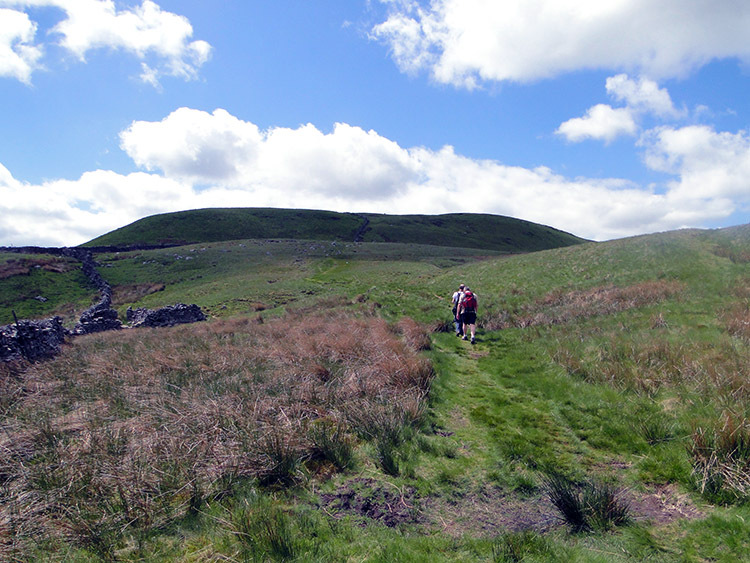 We walked on and continued uphill following the Pennine Way which we had been on since Gaudy Lane. Not long after Ten End Peat Ground though we were forced to leave the Pennine Way and climb the last 100 metres to Dodd Fell Hill top in a beeline and with no discernible path. 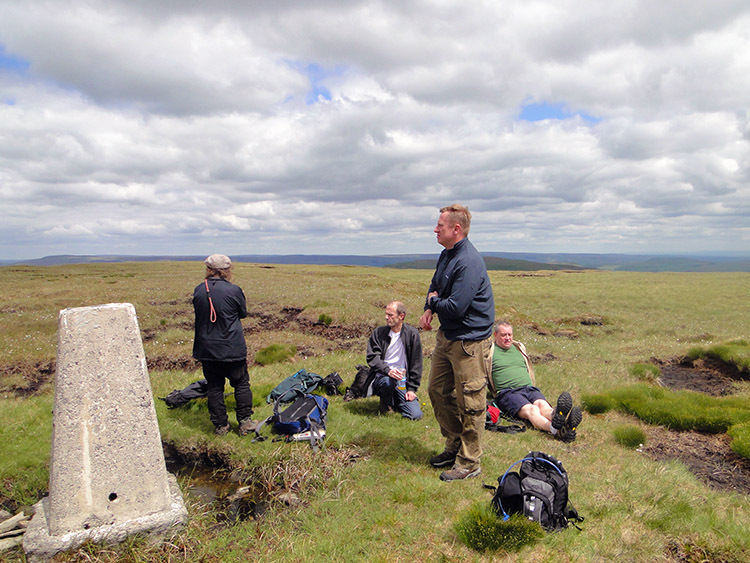 Walking without the guidance of a path and through tussock grass was tough going, as it always is but we were tough guys and all made it up to the welcoming trig point on top of Dodd Fell Hill. The moustachioed poet who graced the fells. Left our shores for pastures new. Through passing time and tolling bells. His legend inspires the chosen few. In his footsteps we must follow. To carry his standard far and high. In the hope he will return tomorrow. To once again lead you and I. After Martyn's inspirational piece we left our new acquaintance, his dog and Dodd Fell. As we did so Jez was thinking. From Dodd Fell Hill we made our way east towards Cam High Road and whilst a more direct line to Wether Fell was possible the loss in height to Bank Gill was not inviting at all. 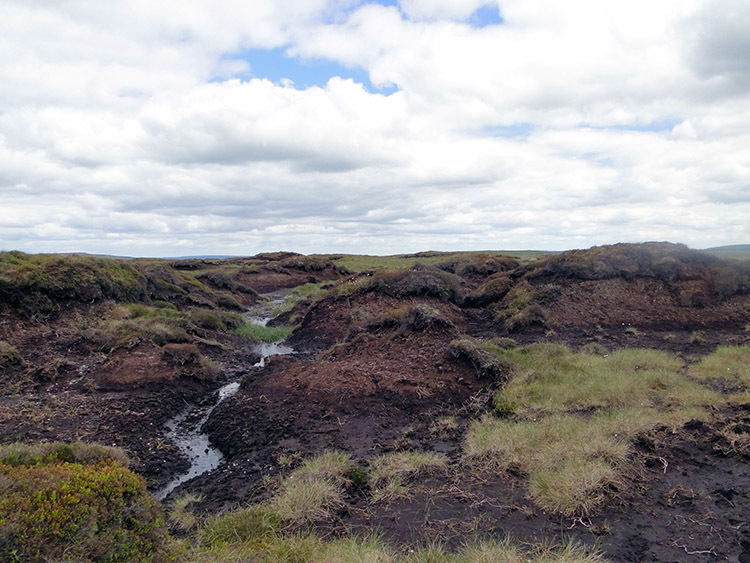 Rather we added a half mile to my original walk plan by staying high and apart from walking through a few interesting (and thankfully dry) peat hags we reached the road. at this time I was enjoying the walk immensely and still somewhat bewildered by Martyn's supreme fanfare to the mega walking Steve. At Cam High road though attention shifted from the arts to sport as we were once again in sight of Hang Gliders on Wether Fell. Before there had been two, now there were four and the thermals were much improved for in turn each of them took to the air. As we neared them attention was diverted once more to a chap enjoying the flight of his radio controlled glider. It was a wonderful day and all of us for different reasons were enjoying it to the full. Alas Dave had to leave us before the final ascent to Drumaldrace, the high point of Wether Fell. Irritatingly he had left his camera on a gate on High Cam Road, about a mile back. Rather than wait for him we agreed that he would recover his camera and then head for Gayle by following the road. With Dave tracking back to recover his camera which he successfully did, Martyn, Jez and I continued on to the summit of Wether Fell. 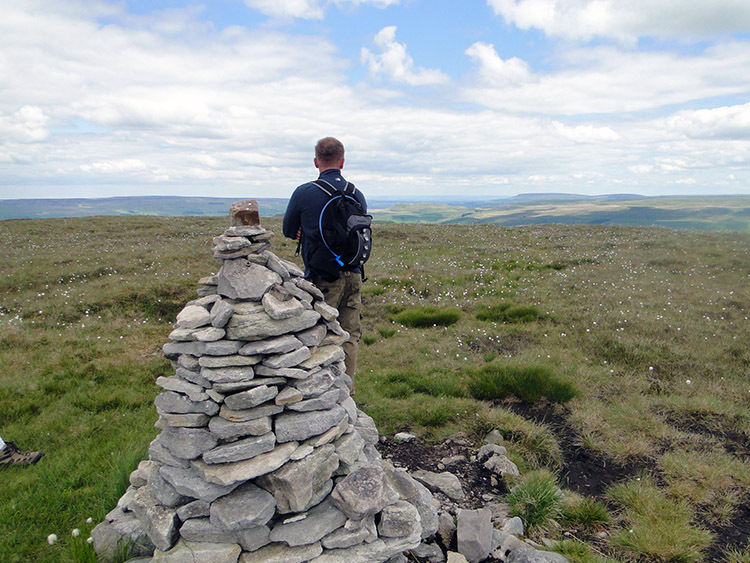 A cairn marked the top and once there we chilled out for a minute to take in even more thrilling views, this time to Wensleydale itself and in particular our eyes were fixed towards Semer Water and Penhill. It was another sublime moment of a momentous walk. 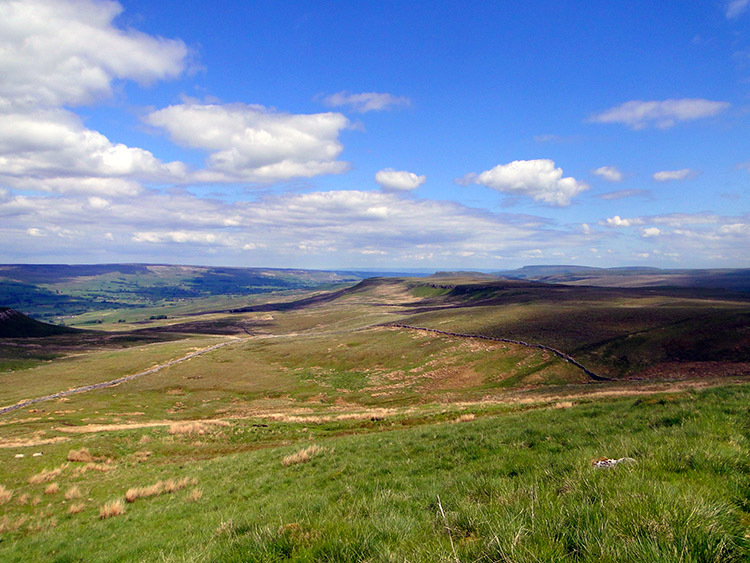 From Drumaldrace I led the way by following sheep tracks across the high plateau of Wether Fell. Alfred Wainwright himself had said that sheep were easily the best pathfinders and I followed the sheep's lead off the fell towards Burtersett High Pasture. We were on the descent truly now, a long interesting descent to Gayle which was highlighted by a third piece of poetry from my super walking colleagues. Not to be outdone by Dave's short off the cuff effort and Martyn's prepared piece this time Jez had his moment of artistic license. So, here for all is Jez's inspired work. I wandered lonely as a sheep. Where sheep no longer went. I turned around and saw a hill. Magnificent! My three walking chums has not let me down by making a wonderful walk all the more memorable with each one contributing to the thrills of the day. 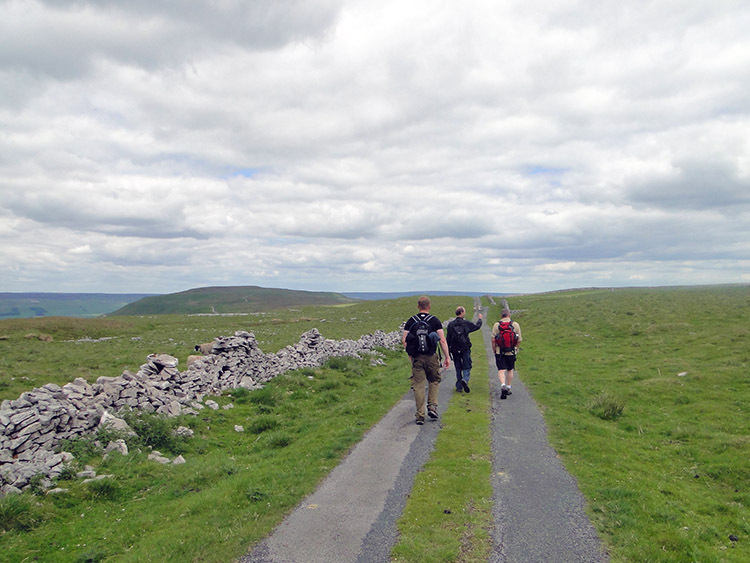 The walk was turning out to be a classic, a superb horseshoe walk of two high fells in the Yorkshire Dales, a walk so unknown and so underrated - I hope this report fixes that and that more and more people take on this beautiful walk with the plethora of fantastic panoramas it reveals throughout its course. For us we just had a the simple task of negotiating our way to the finish. The way back to Gayle"
Did I say 'simple task of negotiating our way to the finish?' There was nothing simple about the last mile and a bit of the walk but it should have been easier than we made it. Seduced by a lovely track off Burtersett High Pasture we had missed a more direct turning home and as a consequence had descended 50 metres on a track to Burtersett rather than taking the one we had intended for Gayle. Not wishing to backtrack up the fell we unanimously decided to traverse the contour line but this proved too difficult for walls and a drop barred our way. Jez plotted a route which took us around the obstacle and after a few unplanned wall scrambles we regained the path we should have took. 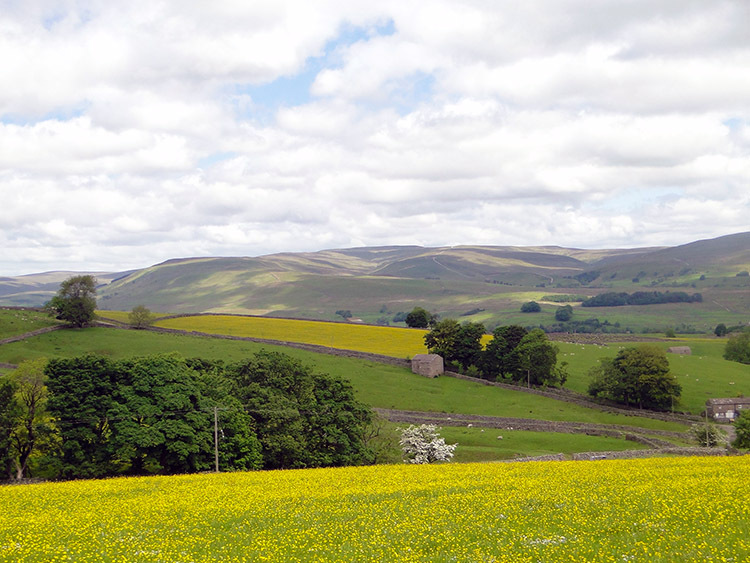 A few fields later and once again in the splendour of buttercups we were back in Gayle. At the car there was no sign of Dave so as we had planned I drove up the road towards Wether Fell and soon we recovered him. Walking team all together again we headed home. We did so in rapture and with abiding memories of a fantastic walk, wonderful camaraderie and with lyrical poetry.